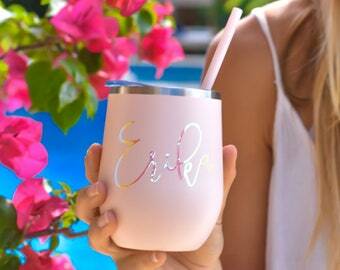 Complete your bridal party or bachelorette party gifts with this wedding seasons must have tumbler! Also makes the perfect gift for anyone who loves a good cold or hot drink! 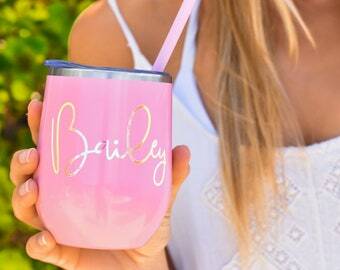 Personalize it with a name, monogram or a saying! 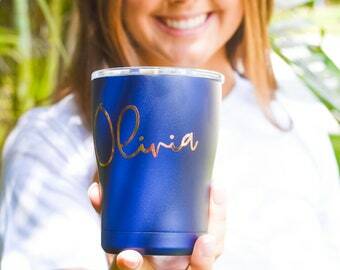 This tumbler is 20 oz and BPA free, vacuum insulated, and finished with a powder coating that protects against dents and scratches. 4. Your shipping will automatically combine when ordering multiples. We recommend lightly hand-washing. Even though I and many customers have great success washing our items on the top shelf of our dishwashers on a none heated dry and on a low delicate wash. All dishwashers range in temperature and settings, wash in dishwasher at your own risk. Standard processing time is 3-5 business days after you have placed your order. If you need your item(s) shipped faster a rush order will need to be purchased, please see FAQS for more details. You can find the date your item will ship on the top of your receipt. Due to all items being personalized we do not accept returns or exchanges. If there are any issues with your order you must notify us within 48 hours of delivery. All processing times are based on you providing all the details needing to complete your order. Orders will be delayed up to 10 days or until you provide all missing details. After 10 days we will cancel your order if we have not received a response from you. We copy + paste the names you provide at checkout, The names will be printed EXACTLY as you type them. Example: if you provide the names in all lowercase, they will be printed all lowercase. If you provide the names with the 1st Letter Capitalized, we will print them with the 1st Letter Capitalized. 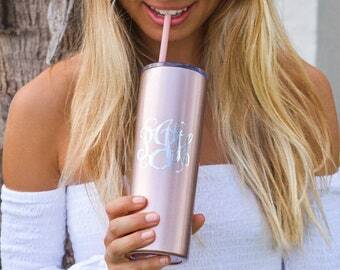 If you do not provide a font color at checkout in the “notes to seller” section, your order will be made using the font color seen in the main photo of the product you ordered. I love them! They are absolutely perfect! 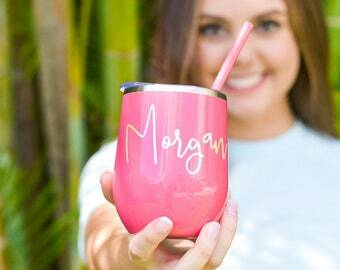 I am giving them to the girls that come to my bachelorette party so we are all matching! So cute!! Thank you! 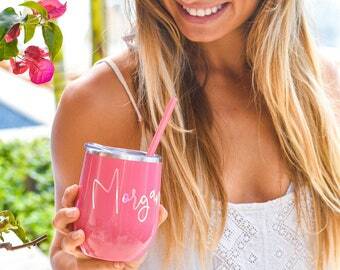 LOVE this cup!! 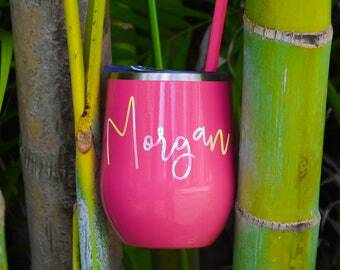 It’s soo cute and keeps drinks super cold for a long time. 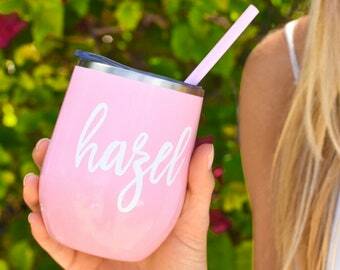 I love the gold lettering and how it changes color depending on how you hold it. Highly recommend, I’ll be buying more as gifts! Shipped within 48 hours of ordering. Very good quality! Highly recommend!! My glass was shipped right away and looks beautiful!! Step 2: Select the “Product Color” and “Font Choice” from the dropdowns. Step 2: Select the “Shirt Color & Size” and “Font Color & Saying” from the dropdowns. If we have any questions about your order in anyway we will reach out to you! We are human and we do make mistakes, sometimes. Send us a message and WE PROMISE to have a new item(s) in the mail to you in less than 24 hours. Please email us at feedback@preppypineappleshop.com, in order for us to process your request. Turn garment inside out and wash wash cold on delicate cycle. Do not bleach, dry clean, or iron directly onto the design. If you need your items sooner than 3-5 business days, you will need to purchase a RUSH ORDER. You only need to purchase ONE RUSH ORDER for your entire purchase. Purchasing a RUSH ORDER will bump your order to our #1 spot and be shipped the same day or next business day. We CAN NOT guarantee any specific delivery date. We can guarantee that we will have your item(s) shipped by a certain date, but once USPS has possession of your order we have ZERO control on when they decide to deliver it. We are not responsible for shipping delays due to incorrect addresses, weather and holiday delays. Weight of box, size of box, and distance traveling. Shipping is automatically combined for multiple items. It is very difficult to change your address after your order is placed, we will try are very best but we are not responsible for deliveries to wrong addresses associated with your Etsy account. We copy + paste the names you provide at checkout, The names will be printed EXACTLY as you type them. Example: if you provide the names in all lowercase, they will be printed all lowercase. If you provide the names with the 1st Letter Capitalized, we will print them with the 1st Letter Capitalized. 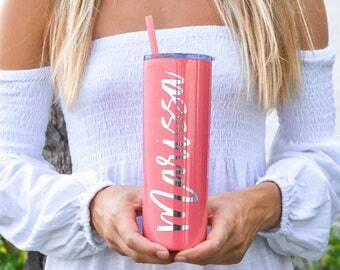 Monograms (Font 7 & 8) are to be provided in Monogram order: First Name, Last Name, Middle Name. 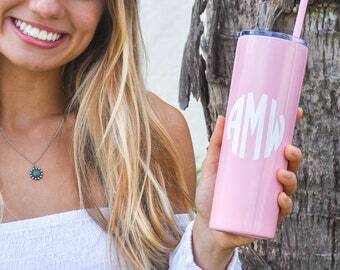 We are not responsible if you provide the monogram in the wrong order. Add each item to cart individually. 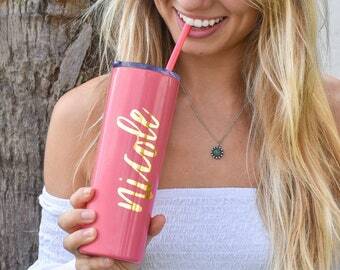 Tumbler Example: You want a Purple Tumbler with white font for Nicole and a Mint Tumbler with Gold Font for Sarah. Add the first one to your cart and then go back to listing and add the other one. Shirt Example: Select the Size and Shirt Color & the Saying and add to cart. Go back to the listing and continuing adding the remainder of your order individually. True to Size, if you wear a size small you would be a size small. Keep in mind this is a loose flowy fit tank, is not tight. Please see sizing chart located in the Listings Photos.